Here at Chapel Doors we have many years of knowledge and experience of installing garage doors we can supply Horman, Cardale, Garador and Alluguard Doors, gates, awnings, entry and intercom systems within Norfolk and other surrounding areas. Whether you're looking for a new garage door, gate or awning or perhaps you're looking for help with repair of an existing solution, we have the skills and knowledge to help you. We offer help and assistance to our customers across the East Anglian region covering areas such as Norwich, Diss, Fakenham, Ipswich and surrounding areas. Here at Chapel Doors we install, service and repair garage doors, gates and awnings within the East Anglian region, servicing Norfolk, Suffolk. Whether you're looking for a new roller garage door, side hung garage door, steel garage door, sectional garage door or a timber garage door, Chapel Doors have years of knowledge and experience to help you. Here at Chapel Doors we supply all our garage doors from leading Garage Door manufacturers such as Hormann, Cardale, Garador and Alluguard to name but a few. We offer an extensive range of high quality garage doors available in steel, timber, glassfibre, PVC-u and plastisol, which come in a wide range of different styles and colours to suit you. We also have the ability to automate your existing system. Whether you're looking to automate your garage door or gate, we can help and advise you on your existing solution or a totally new one. We also offer a full repair and maintenance service for new and existing clients, should you have any problems with your entrance, you can rest assure of a prompt service. We are a family run company and our aim is to satisfy all our clients requirements and we promise you a friendly response with a high level of after sales service. We pride ourselves on our friendly and efficient approach. 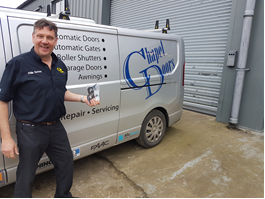 Here at Chapel Doors we have a dedicated installation team on hand to support customers in the Norfolk and Suffolk area. We don't employ any third parties, we have our very own trained, vetted and uniformed installation team who are all experts in their field. We also have an experienced support team who follow our continuous training programme to keep up to date with new products and accessories. Should you require a free site survey, where upon we will be able to quote you on your own specific requirements, then please call us. 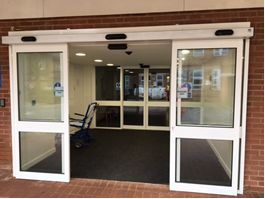 Congratulations go to Philip Ramsay from Chapel Doors for sending in the winning photo of Record STA 20 sliders installed at a hospital in Norwich.